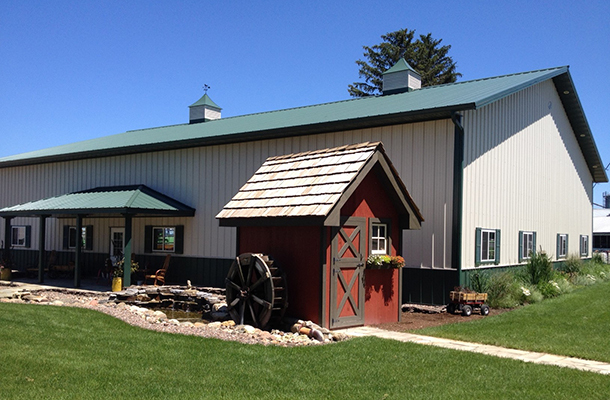 Not only does this Garden Prairie metal ranch have a large farm building. Take a look at that little utility shed there. With it’s own waterwheel! And a pond behind it and rock and gravel around it. A distinctive touch! These farm and ranch metal building houses are some of the many buildings being made by Lester these days. They caught our attention, so we thought we’d share them (as with all the images on our website, you can make them bigger by clicking on them — even the featured image). There are just a few details available for this building. You can use the project number to talk to the builders about this design as a starting point. The idea here is that you’re going to have to talk to the builders anyway, but you can get an idea of what metal buildings are options by looking at what has already been built. Find more from Lester metal buildings, and the metal and steel design and build companies we’ve indexed in our Home Designers and Builders Directory. You can search the company’s name and look builders near your area. And to see more metal homes, click here.